Use less assistance in your next workout to gradually build up enough strength to allow you to do one Pull-up without any extra help. Bonus Tip: Do 2-to-4 sets of FIVE 5-to-10 second negative only pull-ups (as seen here in this video) after you've done your assisted pull-ups to quickly build up enough strength to do 1 pull-up. This is the best way because it's easier for you to track your progress by gradually decreasing the assistance by 5-to-10 pounds. The other 3 ways are harder to verify how close you're getting to being able to do a pull-up on your own. Bands are just as great as the machine but depending on the type & how many bands you have available it may be a difference of 50 pounds worth of assistance between bands and if that's the case... You may have to do sets of 10-to-20 reps before you progress to the next level. Once you're able to complete at least TWO 5-to-10 second negative pull-ups you should be strong enough to do 1 pull-up. To progressively keep getting bigger & stronger back and biceps you'll need to go from bodyweight-to-weighted Pull-ups or Chin-ups. Use a Weight Vest, Dipping Belt, book bag filled with weights, hold a dumbbell or weight between your legs to do weighted Pull-ups or Chin-ups. Tip: Do 3-to-6 supersets of Pull-ups or Chin-ups with Dips to make every muscle in your upper body bigger. Do 1-to-2 sets of 5-to-15 reps of parallel pull-ups. Pull-ups vs. Chin-ups - Which is Better? Pull-ups are done with your palms facing away from you & are usually harder to do. Parallel Pull-ups are done with your palms facing each other. Chin-ups are done with your palms facing you & are usually the easiest to do. Pull-ups focus more on your back muscles. Chin-ups focus more on your biceps. Parallel Pull-ups focus equally on back & biceps. The close grip Pull-up and Chin-up variations work your arms more while the wider shoulder width grip Pull-ups and Chin-ups work your back more. Don't use an ultra wide grip wider than shoulder width because it can actually injure your joints and really wide Pull-ups & Chin-ups decreases the range of motion giving you an even worse back & bicep workout. Sternum Chin-ups not only work your biceps & back but also your chest as well because it's almost like doing a bodyweight pullover but they're also the hardest to do because you have to touch your chest to the bar. Parallel Pull-ups focus more evenly on your back & biceps plus you're able to work on your biceps peak or your brachialis muscles to make your biceps look bigger. Chin-ups & Close Grip Chin-ups both focus more on your biceps but close grip chin-ups (especially when done with extra weight added) is the best compound exercise you can do to quickly get bigger biceps. Do regular shoulder width chin-ups to give more attention to your back (lats) while working your biceps. Close Grip Pull-ups is the best exercise you can do to build up your biceps peak or your brachialis muscles that are centered between your biceps & triceps to make your biceps look bigger. 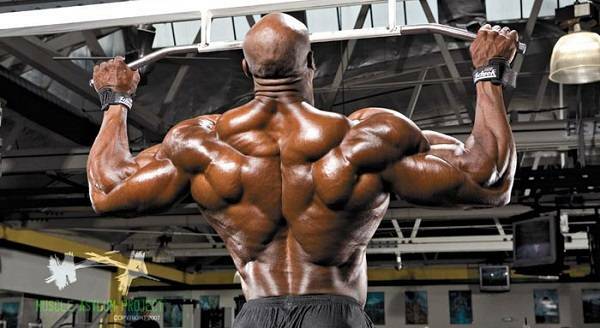 Do regular pull-ups to focus mostly on your back. Hi. I am 15 years old 65kg and178cm tall. I have been trying to do a first pull-up/chin- up. I train negatives with three grips : neutral-grip, chin-up grip and pull-up grip everyday. I do the negatives 20-40s for each rep. I keep my shoulders down and I can feel the muscles working. I have been working like this for 1 and a half months. I still can't do a full chin-up or pull-up although I can do partials about below 90 degrees. Can you help me with this? Or is it that I need to carry on for a longer time? Hey, I love doing pull ups and chin ups, but everytime i workout on the pull up bar, the next day my neck(or trapezius not too sure) feels kind of stiff and the more exsercises I the stiffer my neck/trapezius feels. I wonder what could be the reason of this stiffnes? or if there is something i could do to avoid it ? was that your first time doing pull-ups in a while? I just want to say great article. Pull ups are by far my favorite workout exercise. I like how you've broken down the different types of pull/chin ups. In the fear of over training and not allowing the body to rest and muscle to grow, can I really do a different pull up everyday and effectively rest? If I can I would love to. I do Squats/Overhead Press/Dead lift Mondays, then Squats/Bench/Rows Wednesdays, then back to squats/oh press/dl Fridays, then the next week make my Wednesday my new mom and fri and my mon my new wens. Can I add a different type of pull up each day of the week? is there some reason why you cant do them? Hi Adrian, now that i am able to do 4 chin-ups by following the method you describe with negatives, should i continue with the negative chin-ups or start up with just chin-ups now,i'd hate to neglect the negatives ,they treated me well. Hi there pal, I have a few questions for you. Firstly, I was wondering how long will it be before I see noticeable changes in arm size/back size If I am doing chin ups and pull ups once a week ( 3 sets for each), working up to sets of 10 before adding weight? Also are tricep dips good for adding mass to triceps and how many exercises should I perform for triceps, as I want to keep to bodyweight movements only. Cheers for your time.